The artist collective Decolonize This Place is taking their anti-imperialist message to cultural institutions across the world. On a day traditionally devoted to memorializing imperialist poster child Christopher Columbus, a crew of cultural renegades crashed the American Museum of Natural History in Manhattan with an alternative Indigenous Peoples’ Day celebration. The artist-activist collective Decolonize This Place occupied the vaunted institution with—what else—an educational tour. The crowd of about 200 mostly youthful observers embarked on a subversive walk-through, snaking around displays of “native” artifacts poached from different continents, gazing at the scenes of “primitive” societies in a new light as their radical tour guides gave their own explanations of the exhibits. Their route was mapped out on a red-and-white printed brochure, with a cover depicting the Theodore Roosevelt statue at the museum’s entrance surrounded by police barricades. The collective behind the alternative tour, Decolonize This Place, grew out of the academic and artistic collaborations that began percolating during Occupy Wall Street five years ago. Their museum takeover was a symbolic protest against the gentrification and displacement unfolding just outside the marble walls, in poor communities of color of the surrounding city that are excluded from such elite cultural spheres. The action was incubated in Artists Space in Soho, a freewheeling downtown studio that cultivates innovative contemporary art projects. During their three-month “takeover” at Artists Space, Decolonize is hosting meetings, performances and film screenings, along with art builds, in which activists gather to create protest signs, paint banners, and construct other DIY productions focused on gentrification, global labor activism, Palestinian resistance, and movements for indigenous rights around the world. 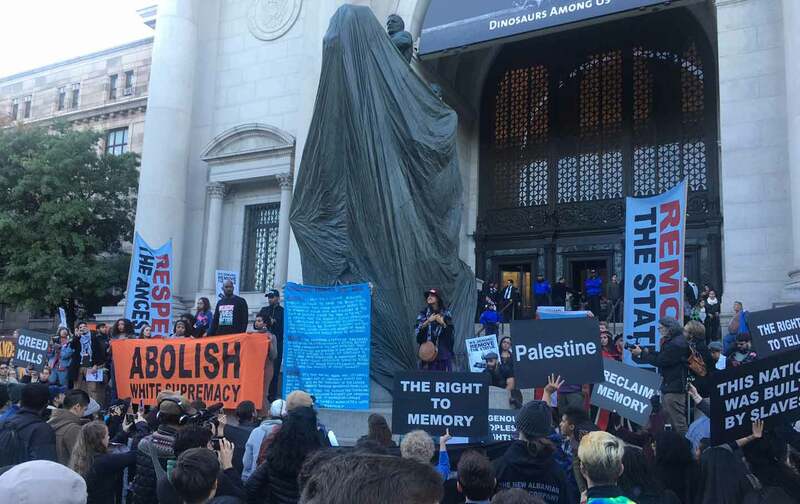 The decolonization movement has also inspired initiatives to take down monuments honoring icons of colonialism like Cecil Rhodes on the Oxford University campus, and challenged corporate sponsorship of galleries like the Tate Modern. As an intellectual movement, initiatives to decolonize museums evolved out of contemporary art discourses on politics and identity, and how established institutions should publicly reckon with structural inequities. The Museum of Natural History has not publicly responded to the action, but Decolonize is following up. In the group’s Indigenous Peoples’ Day Declaration, Decolonize calls on the museum and city government to “Respect, Remove and Rename”; this includes eliminating degrading systems of human classification and racist portrayals at exhibits, returning sacred objects to native peoples, and dismantling the city’s Theodore Roosevelt statue outside the museum, which shows him mounted on a horse, flanked by Native American and Africa-American men. The next phase is connecting Decolonize’s direct action–oriented, neighborhood-based anti-gentrification campaigns to the movement’s broader demand for museums to develop programs that engage surrounding communities, and share resources with local activists and artists to become more democratized, participatory cultural institutions. Roosevelt’s statue may have been covered temporarily, but the event was really about unmasking a long-buried truth: that history isn’t dead. For those who are still struggling to articulate their own stories and fight for self-determination, history is a work in progress.